Aren't these potted pansies in the shabby hanger enchanting? I love this. Ooh, it just makes me want to grab hold of spring and yank it into my life. Can't wait. I've been without a computer for a week now, with no hope of recovering my hard drive. I don't want to talk about the fact that I spilled almost an entire cup of Starbucks Cafe Mocha on my laptop, and that I lost all my photos from the past three years. I'd rather focus on the good news that I had some important things backed up on flash drives, and that many of my personal photos are on my other blog Joyful Altitude. There's something to be said for blog archives. Hubby has kindly loaned me his extra laptop while I wait for my new one to arrive. Once it comes and I get set up, I'll finish a post I started on charming cottage homes designed by an American architectural firm. I think you'll enjoy the tour. Meanwhile, I've been doing a little redecorating in our living room. Remember this picture? It's from my post on finding a new writing space. And do you recall my plan to turn the little blue chest into a desk? Well, scrap that idea. I'm invoking my right as a woman to change my mind, and I'll tell you more about my revised plan in a future post. So the room is nice enough, but "stodgy". (My beloved's word, not mine. But he's right.) It doesn't have the cottage look I love and want. And my husband agrees. (See why I love that man?) He suggested we move out the credenza with the baskets and replace it with a white wicker garden set I picked up at a thrift store for $75 (cushions included). It's in great condition, and the chairs are so comfortable. I love this spot in the early morning when I can watch the sun rise over the mountain. More changes on the way. Sharing with "Green Day On Raindrops and Daisies"
Well, for Pete's sake! I didn't realize you had another blog. I like that pretty table and chairs by the window. I bet you do love to sit there and think and write. Pansies, to me, are the most cheerful flower there is! I agree with you, Dewena. Pansies are the most cheerful flower. I'd like to try growing some indoors as a houseplant in the winter. Oh, yes, that pansy photo is just so colorful and wonderful! Love the last shot of the other flowers as well. First of all, I am SO sorry you lost your photos on that laptop and have lost the hard drive. That has to be so upsetting! Secondly, you were so nice to comment on my FF post a week ago when I did the 5 Facts. We have such great memories of being in the Denver area for six months when she was born. Want to get back there if we can some time this year. Have friends in Greeley we want to see, for one thing. Anyway, I love the changes you are making to the writing room! Hope you get things back up to speed soon, computer-wise. Have a great week! Thanks for leaving such a kind and thoughtful comment, Marie. If you do travel to Greeley it would be fun to meet up, if you have the time. Hugs. First - I am so sorry about your lost photos. I am happy that you have some saved on your blog. Now - I adore pansies! 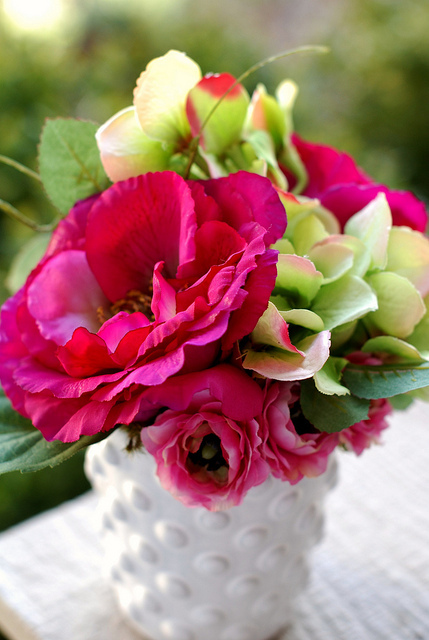 They are simply the perkiest little happy flowers! Come on Spring! I LOVE your sweet wicker table and chairs! Good idea! Plus your geranium seems to approve also. We had snow this morning in Kentucky. It was beautiful but I hope it will be Winter's last hurrah. Love to you and Dennis. I think about you often and it always makes me smile. Thank you your post. Sorry about losing your photos . . . sounds like some good news from saves in flash drives and blog archives. 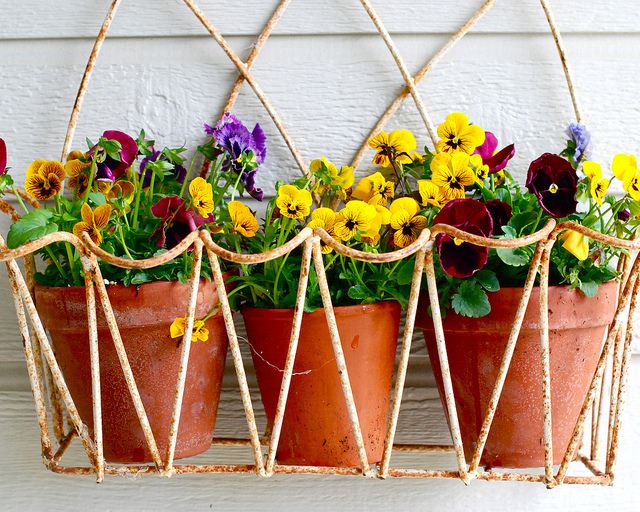 Love the wire holder, clay pots with pansies . . . I would love it! I don't think I would want to move from that spot and oh how wonderful it must be to see the sun rise over the mountain. Happy Sunday to you, Betsy. Dennis and I enjoyed a beautiful sunrise this morning over breakfast. Hope the rest of your weekend is peaceful and relaxed. hopefully it will all get sorted. and this morning for some reason it wouldn't turn on!!! 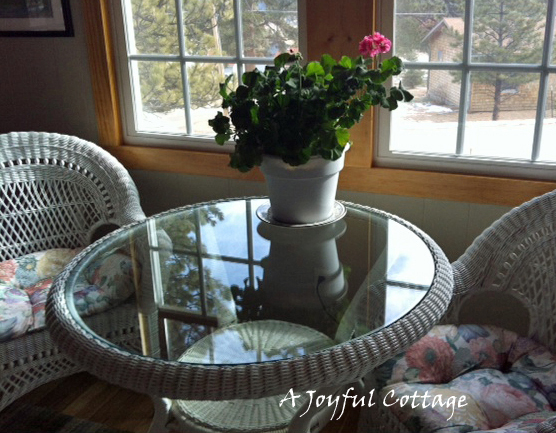 Love the table and chair and flowers, so pretty and the pansies in the top photo are wonderful. ps I didn't know you had another blog either!! Oh Fiona, I hope your computer not turning on this morning was just a fluke. My other blog is more of a photography blog. Mostly documenting nature and some of our life in the Colorado Rocky Mountains. I also had a Christian devotional blog for about two years. Ooops forgot to say thanks for linking up with Green Day! And so sorry about your computer. You'd think they'd make them 'coffee proof'. Since so many people use them in Starbucks and coffee houses... I mean, really? Thank you, Rian, for the sweet comment on my blog header photo. Wouldn't it be nice just to sit there in the blue chairs and enjoy a chat? That is the front garden of The Fawnbrook Inn, and it is absolutely stunning in summer. Hummingbirds everywhere, a little water feature. It's just a precious place. Thanks for sharing in my computer sorrow. It was just a very careless thing on my part, and I learned a very expensive lesson. Hope you're having a wonderful Sunday. Cheers. So lovely! I would want to spend all day there!! A delightful change. I always love how one change makes the whole place look new. The pansies make me yearn even more for spring. We had 7 inches of snow this week and I'm so over winter. But it was beautiful--and cold!